This article highlights the fifteen most affordable online AACSB accredited MBA programs, ranked from #15, to #1 according to our ranking methodology. In the last three years, the number of quality institutions offering online MBA programs has grown significantly, and there is more choice than ever. This article uses a ranking system designed to be useful for students concerned with the affordability of their programs. Affordability is the most highly weighted concern in the system, though the system also takes into account accreditation, and rankings of the specific online programs, regional rankings, and national rankings, if applicable. We include the details on the ranking system in the article. The purpose of including the system is to allow our readers to apply the ranking system to schools not listed here, to see how they stack up. The national average cost of an MBA program is $60,000. For the purpose of this article we have defined “affordable” as total tuition cost under ⅓ the national average. We also reward schools that charge the same rates for resident and non-resident students. The online format’s major benefit is being able to pursue an affordable program from anywhere, on your own time. If a college doesn’t allow residents and non-residents to pay the same price, then it diminishes the benefit of the program for students out of state. Accreditation is important, and there are two primary accreditations to which you want to pay attention for MBA programs. The first is regional accreditation, this is the the basic accreditation any school must have to be considered legitimate. The second type of accreditation is AACSB accreditation. This is a business school specific international accreditation and is the hallmark of the top 5% of business schools worldwide. All of the schools on this list are AACSB accredited, which may leave you wondering why we bothered to assign a value to the accreditation level of the schools, since all the schools will receive credit for being AACSB accredited. The intent of this was to provide readers with a way to evaluate the numerous other online programs that exist that may or may not be AACSB accredited. The third ranking criteria is accolades. In the case of this article the primary accolades on which we focus is recognition by U.S. News and World Report for top national and regional programs, and top online graduate business school rankings. These are important because such ranking authorities factor in many different important variables when ranking these schools. Listed just below is a rubric detailing the ranking system we have used for this article. Please feel free to apply the system to evaluate any other schools you might be considering. MBA students at PVAMU can take courses either in person or online. The online program does not at any time require a presence on campus, meaning it is a fully online program. This is a new feature to find among online programs accredited by the AACSB. In recent years, the fully online program has become more common among these highly accredited institutions. Students in the online mba program take two electives which they can use to specialize in specific subject areas. There are 18 elective courses offered in the online program. The Flexible MBA program offered online by FAU is designed to meet the needs of both holders of bachelor of business administration degrees, and those with degrees in other fields. The credit requirement for non-BBA holders is higher than than for BBA holders which may increase tuition cost. The program also requires more than the typical 30-36 credits necessary to earn an MBA. This is because there is a great emphasis on tailoring the degree to the student’s needs. More required credits introduces more flexibility into the program. You pay more for it, but for those looking for a program that allows them to specialize will find this program particularly attractive. There are actually three online MBA programs at the University of North Texas which are: MBA in Strategic Management, MBA in Marketing, and MBA in Finance. The coursework for each of these degrees is completed 100% online. One odd requirement however is that online students do not have the option of taking face to face classes at the university. All courses for the program must be taken online. There is also an Accelerated Online MBA program that students can take advantage of if they wish to drastically cut the amount of time it will take to earn the degree. The University of Houston Clear Lake has embraced the online format in recent years. The school offers several online programs, and the college of business itself offers students at both undergraduate and graduate levels over 90 online courses. The fully online MBA program is supported by faculty that is sensitive to the differences between online and face to face education. Not only are the faculty of the program experienced business professionals, but they’re committed to providing online students with all the attention and guidance they would receive in a traditional program. The University of Houston Victoria might not be as highly ranked for its online graduate business programs, but the tuition for residents is half that of Clear Lake, and $10,000 less for non-residents, making it a financially attractive alternative. The program, like its sister program is accredited by the AACSB. The real difference is in the delivery of the online courses. Students will have to weigh the benefits of the lower tuition against the possibility that the more expensive of the two programs will be better in their online delivery. *These figures represent the minimum tuition possible to pay taking a 15 credit load for two semesters in a 30 credit program. More credits may be required if the student does not have a Bachelor’s in Business. The tuition for non-residents at Frostburg State University is just $3,000 more than the already low tuition for resident students. Frostburg is already a respected public university, with a quality MBA program, and now they are testing the online waters. Frostburg is one in a growing number of schools offering AACSB accredited online degree programs something that just two years ago, barely existed. OSU is one of the most prominent schools to begin offering online MBA programs in recent years. Students of OSU can rest assured that the degree they are earning is nationally recognized, which is a big deal in the business world. The national recognition is especially important to students whose intent in earning an MBA is career advancement. The school also offers multiple options for course delivery, meaning students have great flexibility when it comes to how they earn their MBA. East Carolina University is both nationally recognized, and highly ranked among the top online graduate business programs. Students seeking a quality education, with a strong reputation, and a proven online delivery system would do well to consider this option. While the non-resident tuition seems high compared to some figures on this list, it is still less than half the $60,000 average cost of an MBA in the United States. The school is devoted to flexibility, allowing students to complete courses both online and face to face. This means students local to the university can take advantage of the significant networking opportunities, but students from across the country don’t have to worry about residency sessions. The online MBA at Southeast Missouri State offers three programs: Sports Management, Entrepreneurship, and General Management. The school uses an identical curriculum for online and traditional MBA programs, and offers students the chance to engage in applied research projects even in the distance program. The low tuition is impressive, particularly the non-resident tuition, which is barely more than a quarter of the national average $60,000 tuition for MBA programs. Jacksonville State is one of the rare universities that offers low tuition to all online students regardless of residency. This is one of the greatest benefits a school can offer students in an online program. Out of state tuition can be cost prohibitive. Often times students from out of state can’t afford online programs. This defeats one of the purposes of online education. Which is to offer programs to students in a variety of locations and circumstances. JSU is committed not only to affordable tuition, but to excellence and continuous improvement in all aspects of its online programs. Accolades: Ranked #131 among the Best Online Graduate Business Programs by U.S. News and World Report. Texas A&M University is one of the top schools in the United States. The online programs at TAMU are no exception to this academic tradition. The school boasts one of the highest ranked online graduate business programs available. For all of its prestige, Texas A&M’s tuition is extremely affordable for residents, and tuition for non-Texas residents is still less than ⅓ the national average tuition for MBA programs. *This is the minimum tuition possible for students taking 9 credits per semester in a 30 hour program. This university offers the single most affordable MBA on our list. 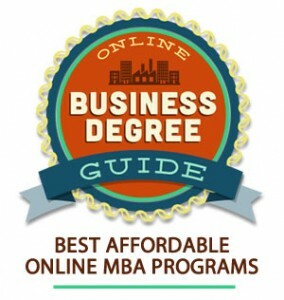 This price is truly a bargain, considering it, as the rest of the programs on this list, is AACSB accredited, and is recognized as one of the strongest online business programs in the country. The program extends its flexibility to foundation requirements for those without an undergraduate business degree. If you have enough experience to pass the non-credit proficiency examinations, you will be spared having to take the foundation courses, meaning this is also one of the best options for those looking for an MBA without having to take an extra 15-24 credits. The online MBA program at Ball State is the highest ranked program on this list by U.S. News and World Report for its online graduate business program at #17. Ball State’s tuition is affordable for both in and out of state students, and it’s also a nationally recognized university. The school is one of the best options available to students seeking an online degree. Tied for first place, the University of South Dakota is a fantastic choice all around. The tuition is low, and the same rate for residents and non-residents. The school is nationally recognized, and is one of the top rated schools for its online graduate business programs. The school has been accredited by the AACSB since 1949, which highlights a consistent culture of academic excellence in its business programs. A culture that extends into the new frontier of online education. The University of North Dakota is the other university ranked at #1 on this list, tied with its southern counterpart. The tuition at UND is slightly less, and its national ranking slightly higher, however its online graduate business programs, while still among the top ranked on this list, are ranked slightly lower than the University of South Dakota. Either school is a fantastic choice for both residents and non-residents, as UND also charges the same tuition rates to students of either status. UND’s distance programs maintain the excellent quality of their traditional programs, while offering students the flexibility needed by modern day business professionals.